A new report suggests Apple will send out invitations on Oct. 10 for a media event at which the company will unveil a new, smaller iPad. Citing an unnamed source, Philip Elmer-DeWitt of Apple 2.0 reported on Monday that members of the press will be invited to the event on Wednesday, Oct. 10. That would suggest the event itself would be held a week later on Wednesday, Oct. 17, as Apple typically gives a week's notice with its invitations. If Apple were to follow recent launch schedules as it has done with the iPhone 5 and new iPad, the so-called "iPad mini" could then go on sale on Friday, Oct. 26. Monday's rumor comes from an unidentified "major Apple investor" who spoke with Elmer-DeWitt and cited "multiple sources" for the date invitations will allegedly go out. Reports first surfaced in August that Apple was planning to hold a media event this month to introduce a smaller and lighter iPad. The new product is believed to feature a screen that will measure 7.85 inches diagonally, smaller than the 9.7-inch display found on all iPad models to date. Leaked components and device mockups have also suggested the device will have a smaller bezel around the screen than the current iPad, as users will be able to hold it easily with one hand. 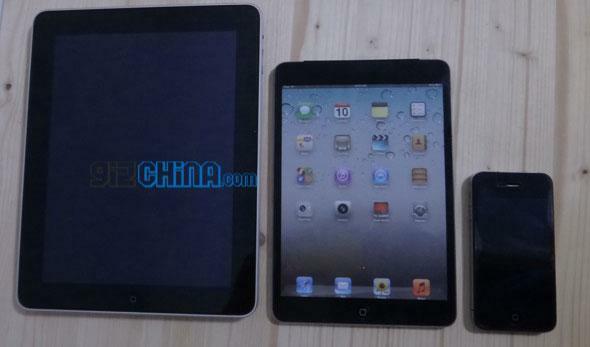 The smaller iPad has also been shown with Apple's new Lightning connector, featured on the iPhone 5 and updated iPod touch and iPod nano.